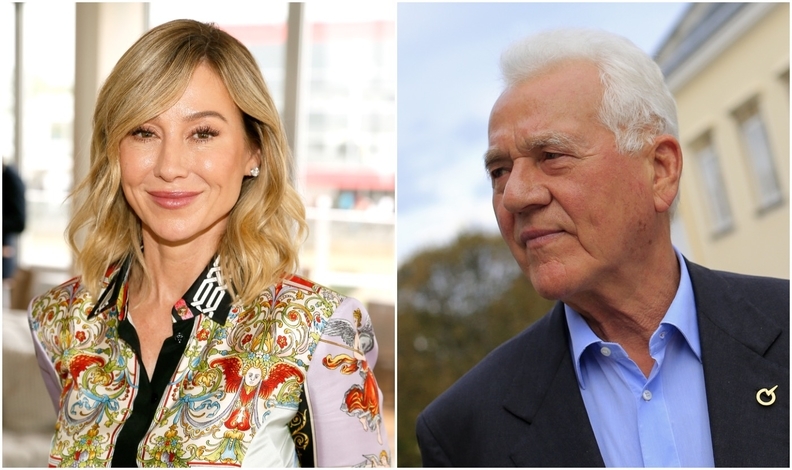 Former Magna CEO Belinda Stronach, left, and the company founder and her father Frank Stronach are suing each other in an ugly family feud. Former Magna International Inc. CEO Belinda Stronach is rejecting claims of mismanagement made by her father Frank, saying she was instead trying to prevent him from pursuing “idiosyncratic and often unprofitable projects” that threatened the family fortune. Belinda Stronach, a former Canadian lawmaker, is seeking about C$33 million ($25 million) from her father, according to a statement of defence filed Monday in Ontario Superior Court of Justice. The amount includes funds “gifted” to Frank Stronach for his 2013 Austrian political campaign, and for a subsequent tax settlement with Austrian authorities. The statement of defence and counter-suit intensifies a feud that has torn apart one of Canada’s richest families. In October, Frank Stronach sued Belinda and individuals including Stronach Group CEO Alon Ossip for C$520 million, claiming mismanagement of the family fortune. None of the allegations have been proven in court. One of Frank Stronach’s lawyers referred a request for comment on the dispute to Dennis Mills, a former Canadian lawmaker and Magna executive who knows both the Austrian-born billionaire and his daughter. Mills said he’s not seen any of the legal documents filed Monday. Frank Stronach’s failed “passion projects” amounted to about US$850 million in investments over the years, according to a separate statement of defence filed Monday by Stronach Consulting, a unit of the Stronach Group. This includes US$324 million on agriculture and US$157 million on thoroughbred horse operations, according to the filing. At the heart of the dispute lies “a fundamental disagreement over the proper test to be applied to managing the business and affairs” of the closely held Stronach Group, Belinda Stronach said in her statement of defense. Neither she nor her father have any involvement with the day-to-day operations of Aurora, Ontario-based Magna, Canada’s largest car-parts maker. A separate statement of defence from Ossip, an executive and trustee of the Stronach Group, paints a similar picture of a successful businessman who may have lost his way. Among Frank’s “passion projects” were two bronze statues of a 12-story high Pegasus horse defeating a dragon that wound up costing US$55 million, according to the statement. One statue is at a race track in Florida, the other is in storage in China. In all, these investments in golf courses, restaurants and farming have resulted in a net loss of US$380 million for the group, according to the claim from Ossip. After a few years of working as a machinist in his native Austria, Frank Stronach arrived in Canada in the early 1950s with a few hundred dollars in his pocket and built Magna into a company with revenue of US$28.7 billion and net income of US$1.1 billion by 2011 -- the year he stepped down as chairman. Magna had sales of about US$40 billion in 2017. Frank Stronach’s non-automotive businesses and investments have included magazines and multimedia operations; a restaurant; a residential development at a ski resort; a tennis equipment company; thoroughbred racetracks; an energy drink company; as well as Austrian soccer league television and marketing rights. Over time, Frank “began to engage in activities, many unauthorized, which placed the business and assets of TSG at considerable risk. These activities escalated to a point where they became a significant distraction for the management” of the Stronach Group, Belinda’s suit said. In the original suit, Frank Stronach claimed Belinda was starving his grass-fed cattle farm of financing, selling off assets over his objections while using company funds to bankroll an extravagant lifestyle of parties, vacations and limousine rides. Frank Stronach and his wife Elfriede said their relationship with their daughter has suffered a “complete breakdown.” The lawsuit against her is a “last resort” after trying for 20 months to find a settlement, according to a 73-page statement of claim filed in a Toronto court on Oct. 1. Stronach Group holds racetrack assets such as Santa Anita Park and Golden Gate Fields in California; Florida’s Gulfstream Park; and the Pimlico Race Course in Maryland. Under Belinda Stronach and Ossip, TSG is generating “significant positive cash flow,” Belinda Stronach said. Stronach Group also has an agriculture unit, which includes Adena Farms, a grass-fed cattle ranch located in Florida. The unit was unprofitable under Frank’s direction, according to Belinda’s lawsuit. The billionaire family feud is good for business at Toronto’s biggest law firms. Blake, Cassels and Graydon are working for Belinda. Davies, Ward, Phillips and Vineberg are on for Frank; Ossip is represented by Osler, Hoskin and Harcourt; Goodmans is working for Belinda’s children and Torys is with Stronach Consulting.